David LeMire MW is a wine industry professional with more than 15 years experience in a number of areas, including retail, domestic distribution, export market management, import purchasing, brand management, and education. Following a two year stint in the UK in 1994 and 1995, spent working in retail, doing some wine writing, and successfully undertaking the WSET Diploma in Wines and Spirits, LeMire returned to Australia and began a sales role with Negociants Australia based in Melbourne. After 15 months he moved into the position of Regional Export Manager, responsible for Asia and Canada. In July 2000 the opportunity arose to take on management of Negociants Australia’s prestigious and wide-ranging portfolio of imported wines, which includes some of the world’s most well-regarded fine wine producers, including Guigal, Domaine de la Romanee Conti, Domaine Leflaive, Gaja, Antinori, and Vega Sicilia, to name a few. Over the following 7 years he managed the rapidly growing sales of imported wines for Negociants Australia, which exceeded the significant growth of the imported category in Australia. The role also involved running the Negociants Australia Working with Wine programme, which provides fine wine education to the retail and on-premise trade in Australia. Between 2003 and 2007, in addition to his work at Negociants, he studied for the Master of Wine qualification, and in September 2007 became a member of the Institute of Masters of Wine. In July 2007 David started his own business, Pronto Vino, providing brand management advice and services to winery clients, and wine education services to the trade and the public. Clients of Pronto Vino include Allegrini, Ata Rangi, Giesen Wines, Kooyong, and Negociants Australia. 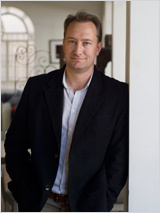 He is also a regular contributor to the Australian Wine Business Magazine, and a wine show judge. David is a keen Aussie Rules footballer, and is married to Danielle (who is relishing the chance to get involved in spreading the word about La Linea) and father to three young daughters. Peter Leske graduated from Roseworthy in 1983 with a degree in Oenology. Since his first vintage in the Hunter Valley, he has worked in a wide variety of production winemaking roles in Australia and overseas, with Mitchelton in the Goulburn; Grosset Wines in the Clare Valley; in California; and a host of prestigious French estates in Burgundy, the Rhône, Bordeaux, and Limoux. These included Domaines Dujac, Alain Graillot and l’Arlot. He also spent a decade as Chief Winemaker in the Adelaide Hills, where he led the small team which built the winery, and made the wines which established the reputation of super-premium producer Nepenthe. Between winemaking roles, Peter spent five years as Manager of the Technical Services Group at The Australian Wine Research Institute. He has a problem saying ‘no’, and has therefore served on innumerable committees, spoken at a host of conferences and seminars, and assisted organisations as diverse as The Australian Society for Viticulture and Oenology, The Institute of the Masters of Wine, The Australian Wine and Brandy Corporation, and the Winemakers’ Federation of Australia, with tastings, strategic planning, and technical issues. He has also contributed many articles for journals, and most recently, led the writing of theSensory Evaluation chapter for a planned Australian winemaking textbook. Whether or not it ever gets published is out of his hands, but he’s pleased with what he wrote…! He also worked with the South Australian Wine Industry Association, dealing with environmental issues such as drought and potential accelerated climate change… the sorts of thing one can fix in an afternoon… and he remains active in the area, assisting regional associations and individual businesses plan for the future. He completed an MBA in 1988, but describes his greatest challenge and achievement as sharing in the parenting of two beautiful daughters. That and putting up with a rag-tag gang of mates who supposedly play volleyball in his social team. Social being the operative word, here.